West Linn senior running back Dawson Jolley scored on runs of 4, 41, 48, and 71 yards, leading the Lions to a 46-14 Three Rivers League rout Friday over Oregon City at Pioneer Memorial Stadium in Oregon City. Senior quarterback Ethan Long also ran for a touchdown and threw touchdown passes to Damiko Tidmore and Cade Knudson as the Lions (6-3, 3-2 TRL) finished the regular season tied with Lakeridge for third place. Oregon City quarterback Colby Iverson threw an 11-yard touchdown pass to Calvin Green in the second quarter and scored on a 14-yard run in the fourth quarter for the Pioneers (4-5, 1-4). Friday marked the 98th regular-season meeting between Oregon City and West Linn. The Lions extended their winning streak in the series to five games, while the Pioneers still hold a 50-47-1 lead in what is recognized as the longest, continuously played high school football series in the West. West Linn put Friday's game out of reach early as Long threw an 8-yard touchdown pass to Tidmore, Jolley scored on runs of 48 and 41 yards, and then Long scored on an 8-yard run to give the Lions a 25-0 lead before the end of the first quarter. Jolley scored again on a 71-yard run with 5:17 to play in the second quarter, and then Knutson caught a 31-yard touchdown pass from Long with 3:11 left in the half, pushing the Lions' lead to 39-0. Oregon City found the end zone for the first time on Iverson's pass to Green with 1:02 to play in the second quarter. Iverson, who transferred to Oregon City from West Linn for his senior season, completed 8 of 22 passes for 69 yards and rushed 28 times for 128 yards. 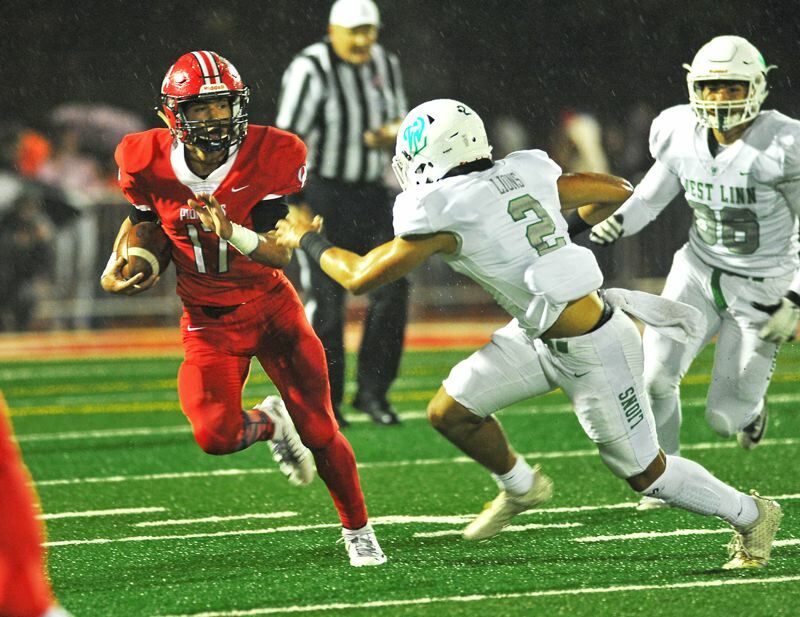 Oregon City's Zakayas Dennis-Lee finished with seven carries for 53 yards, but was held out of the end zone for only the second time in nine games. Atlee Dodge added nine carries for 68 yards, and Zachary Woods had eight carries for 36 yards as the Pioneers finished with 360 yards rushing and 429 yards total offense. After the loss, Oregon City dropped four spots in the OSAA Class 6A power rankings to No. 16, yet earned a home game for Friday's opening round of the playoffs against No. 17 Grants Pass (6-3). Oregon City opened the regular season at Grants Pass and rolled to a 64-41 victory behind Dennis-Lee, the 5-foot-11, 185-pound tailback who had 20 carries for a season-high 323 yards and four touchdowns, plus a 91-yard kickoff return for a touchdown. In nine games, Dennis-Lee has 128 carries for 1,248 yards -- a 9.8-yard average -- and 18 touchdowns. He also has caught 11 passes for 163 yards and two touchdowns, and has scored on two kickoff returns. SCAPPOOSE 64, LA SALLE PREP 28: Junior quarterback Jakobi Kessi threw three touchdown passes and ran for two other scores, lifting the No. 6 Indians to a home win Friday over the Falcons. Senior running back Quincy Cleveland added two touchdown runs and senior wide receiver Connor McNabb caught touchdown passes of 19 and 24 yards as the Indians (7-2) closed the regular season on a three-game win streak. La Salle senior quarterback Ethan Edgerly completed 10 of 21 passes for 96 yards with one touchdown and two interceptions, and also had 12 carries for a team-high 80 yards rushing and one touchdown for the Falcons (6-3). Edgerly threw a 19-yard touchdown pass to Mathew Evans that pulled the Falcons within 13-7 with 2:34 to play in the first quarter. He later scored on a 7-yard run that cut Scappoose's lead to 21-14 with 5:51 to play in the second quarter. Scappoose's Gavin Larson answered with an 88-yard kickoff return for a touchdown, and then Kessi threw touchdown passes of 35 yards to Larson and 24 yards to Connor McNabb, extending the lead to 42-14 at halftime. "Scappoose was very good up front," Falcons coach Aaron Hazel said. "We shot ourselves in the foot in the second quarter with a few blown assignments." La Salle's only points in the second half came on Edgerly's 3-yard run with 4:30 to play in the third quarter and Brody Crowley's 4-yard run with 7:33 to play in the fourth quarter. Sophomore running back James Menor finished with 10 carries for 54 yards for the Falcons, junior running back JaJuan Lane added 14 carries for 24 yards, and sophomore quarterback William Rakoz had six carries for 33 yards. The Falcons dropped two spots in the final OSAA Class 5A power rankings to No. 13, but enter the playoffs as the No. 12 seed and will face No. 5 West Albany (8-1) in Friday's 7 p.m. playoff opener in Albany. PUTNAM 50, CLEVELAND 30: Jadden Hall, Ozzy MacKenzie, and Cody Willison scored two touchdowns each as the Kingsmen racked up 304 yards rushing and closed out the regular season with a come-from-behind home win Friday over the Warriors. Sebastian Fernandez-Callaway and Caleb Tovey also scored touchdowns for the Kingsmen (2-7), who outscored the Warriors 36-7 in the second half to win for the second time in three games. Trailing 23-14 at halftime, Putnam rallied when MacKenzie scored on a 1-yard run with 5:05 to play in the third quarter and Tovey scored the go-ahead touchdown on a 33-yard run with 2:40 left in the third. The Kingsmen then blocked a Cleveland punt and Hall picked up the loose ball and scored on a 4-yard return, pushing the lead to 35-23. After Hall scored on a 3-yard run to make it 42-23, Cleveland's Jaydon Hamblin threw a 45-yard touchdown pass to Demarkasay Davis and Putnam's Fernandez-Callaway scored on a 4-yard run to seal the decision. "Defensive coordinator John Telesmanich made some excellent halftime adjustments and the players executed them to perfection," Kingsmen coach Tim Jacobs said. "It was also nice to see our seniors finish strong in their final home game." MacKenzie, one of 14 seniors playing in his final game for Putnam, led the ground game with 11 carries for a game-high 109 yards rushing. Tovey tacked on another 67 yards rushing on seven carries and Willison added 58 yards on 13 carries. Cleveland's Ruben Valle finished with 19 carries for a team-high 71 yards rushing, and Hamblin completed 7 of 21 passes for 150 yards with two touchdowns and one interception for the Warriors (1-8). HILLSBORO 28, MILWAUKIE 6: Junior quarterback Kane Kiaunis completed 11 of 19 passes for 133 yards with touchdown passes to Elian Lopez-Arana and Nate Smith, leading the Spartans to a season-ending road win over the Mustangs at Alder Creek Middle School. Milwaukie's Korbyn Amundson finished with six carries for a team-high 53 yards rushing, and Logan LaPine had nine carries for 15 yards and a touchdown for the Mustangs (2-7), who struggled under the rainy, wet conditions with four turnovers and one blocked punt. Milwaukie faced fourth-and-6 at the Mustangs' 26-yard line when Smith blocked a Mustangs' punt, setting up Tristan Keefer's 6-yard touchdown run on the next play to give Hillsboro a 7-0 lead with 3:07 to play in the first quarter. After Hillsboro got the ball back on a Keefer interception at his own 43, the Spartans went on a nine-play, 57-yard drive that ended with Kiaunis throwing a 30-yard touchdown pass to Smith, pushing the lead to 14-0 with 8:19 to play in the second quarter. Milwaukie then went on a 13-play, 62-yard scoring drive, cutting Hillsboro's lead to 14-6 when LaPine scored on an 8-yard run with 1:04 remaining in the first half. After an exchange of punts to open the second half, Hillsboro mounted an eight-play, 58-yard drive, capped by Kiaunis throwing an 8-yard touchdown pass to Lopez-Arana that extended the lead to 21-6 with 4:48 to play in the third quarter. On the Spartans' next possession, Slade Shufelt scored on a 1-yard run at the end of a three-play, 24-yard scoring drive that was set up by a Milwaukie fumble. The Mustangs had the ball only four times in the second half, with two of the drives ending with punts, one with a fumble, and one with an interception deep in Hillsboro territory.